Take Action! On April 5, call the White House to demand PATRIOT Act reform! On April 5, 1792, President George Washington vetoed a bill — the first time in U.S. history that the presidential veto was exercised. On the anniversary of this day, we’re calling on Barack Obama to exercise his presidential powers to veto any PATRIOT Act renewal bill that does not include powerful reforms to safeguard civil liberties. As a candidate, Obama repeatedly promised to reform the PATRIOT Act. He also promised Get FISA Right, in his response to our open letter, that he’d ask for “recommendations on any steps needed to preserve civil liberties and to prevent executive branch abuse in the future.” With the battle in Congress over key clauses of the PATRIOT Act heating up again, now’s a great time to ask him to live up to his campaign promises. The legislative situation is very fluid. Legislation in the House is likely to drop soon. In the Senate, Leahy’s S. 193 will be the basis for a floor debate, with amendments likely to be proposed by both sides. The Obama Administration supports S.193, but many privacy and civil liberties organizations support the JUSTICE Act’s much stronger protections, including better oversight of the use of national security letters (NSLs) as repeatedly recommended by the Department of Justice’s Inspector General, more effective checks on “sneak and peek” searches , and roving wiretaps, and revising the “material support” standard to require that prosecutors prove that defendants knowingly intended their support to further violent extremism. By taking a strong stand for civil liberties, Obama could help shape the upcoming Congressional debate. Will Obama listen? Thus far, his administration seems to have largely followed the Cheney/Bush path on civil liberties. With so many other contentious issues in the pipe, it’s easy to be skeptical whether he’ll make a stand on this one. That said, Obama’s not the only one we’re trying to send a message to with this call-in day. Making a lot of noise will also catch Congress’ attention and hopefully remind the media that the multi-partisan opposition to the PATRIOT Act is continuing to organize. So please don’t let your skepticism become an excuse for inaction. If you’re sick of the PATRIOT Act, this is a chance to actually do something about it. So please get involved even if you’re not sure it’ll matter. We’ll follow up on the call-in day later in April, during the two-week recess, it’ll be a great time to meet key members of Congress in the House and Senate. Right now, though, it’s Obama’s turn. Most importantly, call the White House at 202-456-1111 on April 5, between 9 a.m. and 5 p.m. Eastern time. Tell President Obama to keep his campaign promises by vetoing any PATRIOT Act renewal bill that lacks substantial new checks and balances to protect the privacy of innocent Americans. EFF has some more detailed talking points. You can RSVP on Facebook, via EFF or Demand Progress. help get the word out! Share links and forward on email action alerts. Sign up on the Facebook event and invite your friends. Talk about the PATRIOT Act with friends and family and your colleagues at work — ask what they think, tell them about your concerns, and tell them how they can get involved. And start planning now to meet with your legislators when they’re back in your districts between April 18th and May 1. BORDC has some great suggestions. Check back for updates — At least for me, Twitter is the easiest way to stay informed; or sign up with any of the organizations involved to be on their mailing lists. Speaking of Twitter, we will also be discussing this at #privchat on April 5. If you’re not on Twitter, here’s how you can get started. After February’s unexpected victory in February, now’s a key time to build on the momentum. So please — get involved! This entry was posted on Wednesday, March 30th, 2011 at 3:54 pm and is filed under Justice Act. You can follow any responses to this entry through the RSS 2.0 feed. You can leave a response, or trackback from your own site. One Response to Take Action! 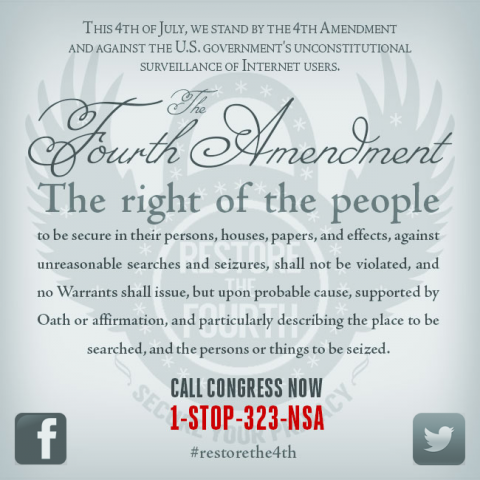 On April 5, call the White House to demand PATRIOT Act reform!